Eric Rücker Eddison was a major influence on J.R.R. Tolkien, C.S. Lewis, and Ursula K. Le Guin. Zimiamvia Trilogy — (1935-1958) Publisher: The classic epic trilogy of parallel worlds — one a magic realm, one a tormented realm — of gods and humankind. Like The Worm Ouroboros, Mistress of Mistresses is a book that only E.R. Eddison could have written and is one that is likely to garner an even smaller following than the admittedly obscure Worm. 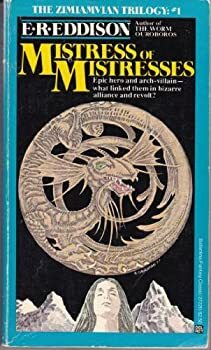 For my part I think that Mistress of Mistresses, and its subsequent sequels that make up the ZIMIAMVIA trilogy, is perhaps Eddison’s best work. It may not be as approachable as The Worm Ouroboros (and boy is that saying something! ), but I think its greater depth and scope make for what amounts to a truly impressive achievement. The Worm Ouroboros is a love-it-or-hate-it book. Mannered in its language, weird in so many ways, and chock-full of larger than life characters acting in ways that most people just don't get. 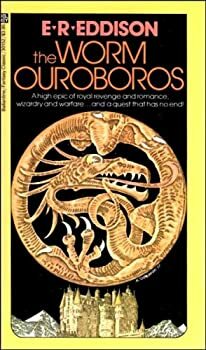 If you have a problem with something written in an archaic style, then you probably won't get much out of The Worm Ouroboros, but if you like that kind of thing I think the book repays reading and is definitely worth it. First off a caveat: it took me two reads of The Worm Ouroboros to appreciate it and a third to decide that I thought it was genius.